Welcome to Eastern Suburbs AFC! If you are considering joining us in 2019, please check out the "Player information" tab for all exciting programmes that we run. Under each grade you will find information about your in-house options & rep training programmes - your child's grade is the year that they will turn this year. AFF TEAM TRIALS are run throughout Term 1 Preseason Training, where our coaches will get to know more about your motivations & skills as a player. If you would like to be considered for a rep team, you MUST register and take part in Term 1 2019 training. For more information check out the Rep Training section of your child's grade page. Welcome to the Eastern Suburbs website. 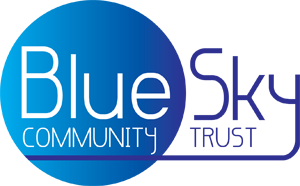 Latest news for the club is below, and news for each section (Junior, Youth or Senior) can be found on the homepage for that section above (on the gold tool bar). If you are new to the club we welcome you. Please go to the appropriate grade page and if you need more information don't hesitate to email the grade coordinator and they will be happy to assist you. 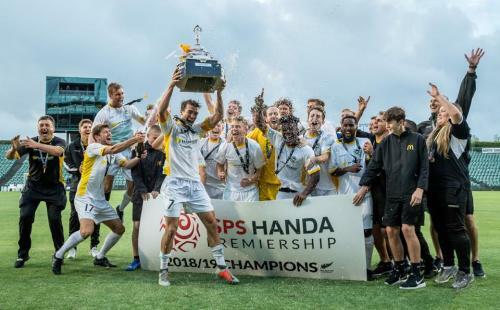 Eastern Suburbs have won the ISPS Handa Premiership title for the first time after delivering an impressive performance to defeat two-time champions Team Wellington 3-0 this evening at QBE Stadium in Auckland. 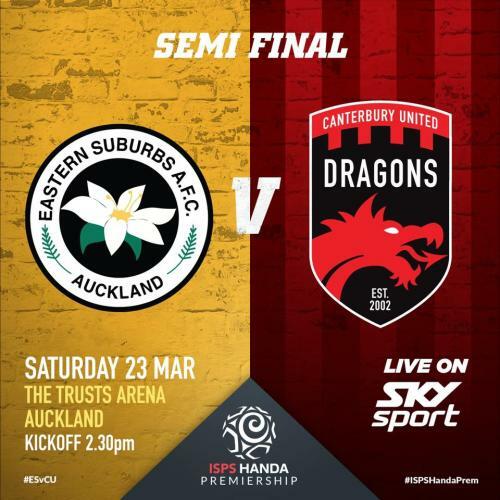 The win sees Eastern Suburbs not only claim the ISPS Handa Premiership for the first time – their previous title triumph was in the old national league – but also secures a historic place in the OFC Champions League for next season! 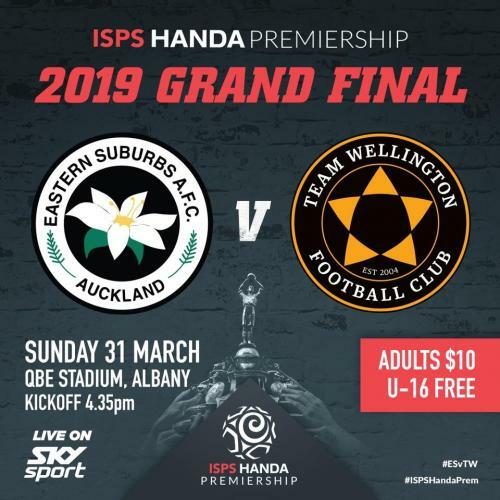 Our Lilywhites will be taking on Team Wellington in the ISPS Premiership National League Grand Final on Sunday as they search to secure an honour not won by Suburbs since 1971. Let's paint the stadium white in support of our team as they thrive to one of New Zealand's top football achievements. Due to the National League Final on Sunday the Senior 7-aside tournament has been postponed until later in the season. We instead would like to ask that all ESAFC members (young and old!) head over to QBE stadium in support of our boys! As many of you will now be aware, the AFF competition teams for 2019 have been announced. Please click on the following link if you would like confirmation of your child’s team. Apologies for any confusion that resulted in the teams being announced late last week. There was a significant oversight on our behalf that may have caused some consternation. Separate communication was meant to be sent explaining that if your child’s name does not appear on the team lists, then they will be allocated an in-house team. Due to the ever-increasing registered playing numbers, we simply have far more players than allocated AFF teams. This is a major reason our coaches have taken their time to identify the players. As a club, we are convinced that our in-house competition is of a better level and therefore provide greater development for the player, than being part of the lower levels of AFF competition. Finally, a reminder that if your child is enjoying the training sessions and would like to keep developing through them, then they should register for Term 2 training. Missing out on an AFF competition team does not mean they need to miss out of developing through training sessions. I hope this clears up any confusion. Enjoy the upcoming season. ISPS Handa Premiership: Semi-Final Time!! Following the Lilywhites' most successful season in the modern-day National League with an astounding 53 goals scored in just 18 games, we are excited to announce that we have taken second place in the Minor Premiership and secured a home Semi-Final! For a number of reasons, including pitch quality and spectator experience, we have made the decision to travel to Trusts Arena, Henderson. Please join us in support as our boys look to go all the way, and don't forget to wear white!! Purpose: ESAFC invite local residents, Madills Farm users, and interested parties to consider the development of the club rooms and changing rooms as identified in the Council's Master Plan for Madills Farm. 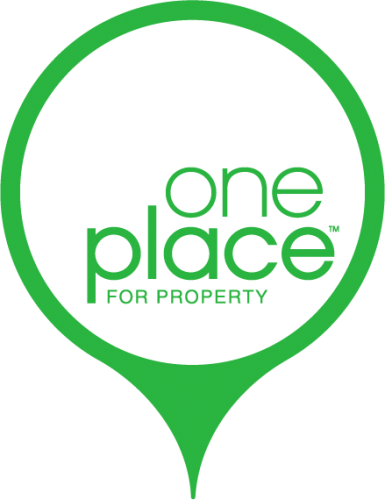 ESAFC will chair and facilitate the meeting in order to seek opinions and ideas before developing their considerations for improved community-use facilities. We welcome your views. The meeting will aim to communicate the Council's Master Plan for Madills Farm, discuss who we are as a club, viewing of the changing rooms, consideration of redevelopment options, and ongoing communication channels. After nearly a month away from the pitch, the Lilywhites look to keep firing in the final games of the season and take on cross-town rivals Waitakere United. Our last fixture against Waitakere saw Eastern Suburbs come away with a 2-0 win. Can the Lilywhites continue their 2019 winning streak and put 2 more in the net? Head down to Riverhills on Saturday and find out! 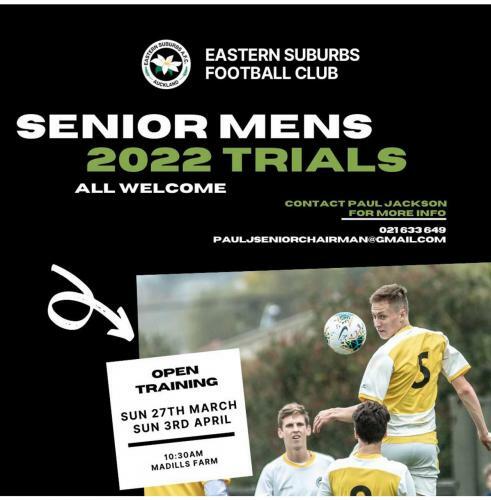 Eastern Suburbs reschedules training times for the Lilywhite National League squad from the traditional after work evening trainings to a mid-morning time zone. The following is an interview with Danny on the changes to their training times. First and foremost, the move to morning sessions is simply about doing what’s best for the players and their development. We have Kiwi players who are genuinely serious about football as a career path...by serious I mean not “playing at it”, but fully prepared to make sacrifices and work extremely hard on a daily basis. To improve their development we need to change our training and developing approach. Sessions in the evening, after a day at university or work, was proving less than ideal. We were finding our players were mentally and physically fatigued in sessions and were getting home around 9pm on training nights. As a result they’ve been struggling to get a grip of their nutrition and sleeping patterns, their development and performances suffered as a result. We also need to recognise the global nature of top-flight football, where players from every corner of the planet make up different teams in different leagues around the world. Our young Kiwi players are competing with these players for contracts so we need to be giving them the best opportunity possible to succeed. How are the players in the National League squad adjusting to the change? The players are rightly loving it. The quality and intensity of the sessions has noticeably lifted for all the reasons stated above – they’re fresh, have slept well and are really taking the time to ensure their nutrition is that of the best athletes. They also love the opportunity to work with Sunz Singh, our world-class strength and conditioning coach, in the afternoons if they choose to. They really are able to prepare and train like pros. And how are you and the coaching staff adjusting and enjoying the time change? Like the players, we are coming to the morning sessions fresh and enthused. We can meet prior to sessions, go through any planned video presentation, preview that day’s session plan and ensure everybody is clear about what we are trying to achieve. It’s fantastic, as we genuinely feel that we are better prepared to help develop these young players. Why are the men’s winter Premier also required to change to morning trainings? We’ll have a number of National League players transition through into our NRFL Premier Men’s team to ensure they are working at a high level for the majority of the year. It’s important to ensure the standards we set in summer, are also the standards set for our winter Premier team. We also have some players who have aspirations of achieving overseas contracts mid-way through 2019, as well as a number who will be in contention for NZ National Teams. So, it’s crucial we ensure they have the best opportunity to continue their development in an environment that fosters excellence. Finally, any other comments or thoughts? The overriding reason for making the decision to train in the mid morning time zone rather than the traditional after-work evening period was simply that mornings are the best time of the day to train, it also simulates a professional football environment. But it makes a huge amount of commitment and sacrifice from the players, including a financial sacrifice for many as there is lost earning potential. It is also a huge statement of intent from Eastern Suburbs. For the players, this is not for everyone, but it is for those who are genuinely serious about their development and pathway in the game. SENIOR 7-ASIDE TOURNAMENT: To kick the season off and get some game time in, we will be holding a 7-aside tournament on Sunday 31st March from 10am to 2pm. More information to come. Don't forget to head along to our 2018 AGM on Thursday 8th November - 7:30pm start! Still undefeated and heading in to match week 5 - will Auckland City FC have the strength to compete? Head on over to see whether our boys can pull off another awesome performance! Our National Youth League Lilywhites also take on Auckland City this Saturday! Please be advised that Eastern Suburbs Association Football Club will be holding its Annual General Meeting at the Madills Farm clubrooms on 8th November 2018 starting promptly at 7.30pm. Lights installed at Madills Farm to extend our training facilities. 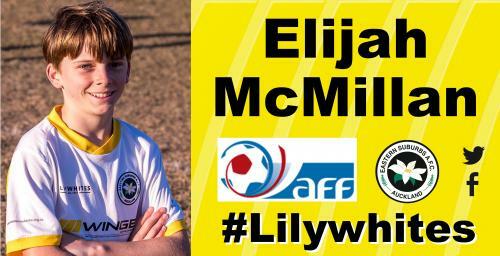 Elijah plays in the 12th Grade and this is his footballing journey so far and how he ended up playing for the #Lilywhites. "I played rugby for Varsity for 5 years and wanted a change. I liked rugby but it was getting too rough and physical, I had to keep going to the chiropractor to get my back fixed. I also wanted to try a sport that lots of friends from school played. All of my soccer playing school mates play at Eastern Suburbs and this is the closest club to home. I like playing games close to home each weekend. Everyone at the club is friendly and Paul is a really good coach. I’ve tried out different positions on the field and now I play at centre midfield. I love running and have found that soccer is fast and fun to play too. I like kicking the ball around and trying to score goals. I also liked playing in the tournament as it meant lots of running around. I think I’m naturally good at soccer and want to play again next year!". Sadly, Kevin Harlock, our Goalkeeper from 1966-1970 passed away on Tuesday, 4 September aged 71 years. Kevin played 91 games for the Club and joined us in strange circumstances. After winning the Chatham Cup in 1965, Charlie Dempsey had arranged a game in Sydney at Labour Weekend. At training one night Ken Armstrong asked me if I could arrange a goalkeeper as Terry Moore, our keeper couldn’t get time off work. Ken knew I was friendly with Kelvin Munro (the North Shore Keeper) and said he didn’t want Kelvin because he had already coached him at the Shore. The following week at Training Ken asked if I had any luck with a keeper. I told him I had but there are two conditions attached to it – 1. he rooms with me and 2. he plays in goal for us next year. Ken jumped up and down and said he didn’t agree to any conditions when he didn’t know who we are talking about. I told him it was Kevin Harlock, the New Zealand Under 23 Keeper from Huntly Thistle. He shouted “you win on both conditions, but how did you get him because I tried earlier in the year but he was not interested.” “Let’s just say I know his father well and have played against and enjoyed a few beers with his two uncles”. Kevin was a very good keeper and very well thought of by all who played with him. Kevin passed on his footballing prowess with his two sons: Kenny & Neill both playing for the All Whites. Ever the family man, Kevin was often 'spotted' at Madills watching his grandchildren (Cameron & Cherie) play for their respective Lilywhite teams. Kevin also attended a number of recent Premiership matches watching the new generation of Eastern Suburbs players playing in the National League. Kevin, you will be sadly missed. Head down to QBE Stadium on Sunday 10th September and check out some of our Ole Academy graduates! The following players will be competing in the Chatham Cup final, playing for Western Suburbs as they take on Birkenhead United! These players will also be joining our ever-strengthening ISPS Handa National League squad. Full Lilywhite squad information to be released in the coming weeks. It's that time of the year to start thinking about Summer Football! This summer season we will be running 7-aside in partnership with Ellerslie AFC & Football Fix for ages 8 - 17, as well as a 4-aside competition for ages 6-7. CLICK HERE for registration details! Registration for the 2018 season opened on Jan 1st. Please click on to the Registration Button below. For all information about the correct grade for the player registering, please view the drop down menu above under "players" and look for your grade. e.g. a player turning 12 in 2018 will be 12th grade, a player turning 6 in 2018 will be 6th grade. A player over 18 years of age is a Senior. Welcome to the team of Sponsors Lumino The Dentists! Brush twice a day, Lumino twice a year! 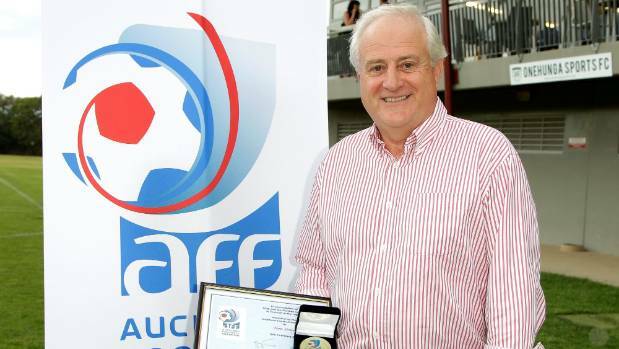 Eastern Suburbs AFC President, Tom Street, has received a long service award from Auckland Football Federation for his contribution and commitment to the game. Thank you, Tom! Congratulations to NYL duo Charles Spragg & Matthew Palmer on their hatricks against Samoa! Congrats also to Max Mata who got on the score sheet and captained the team to an emphatic victory! For all matters related the Laws of the Game click here.